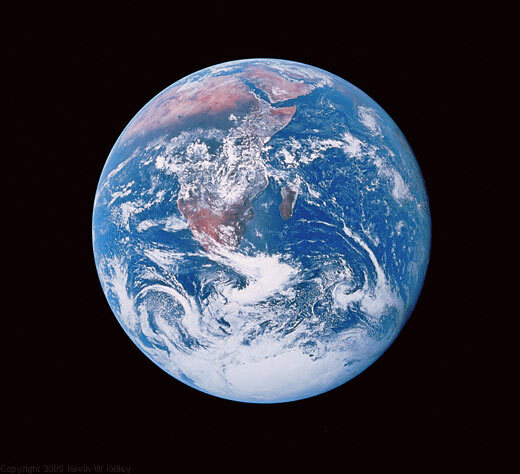 In 1969, The Apollo 4 unmanned flight made a great ellipse around the Earth as a test of the trans-lunar motors and of the high speed entry required of a manned flight returning from the moon. 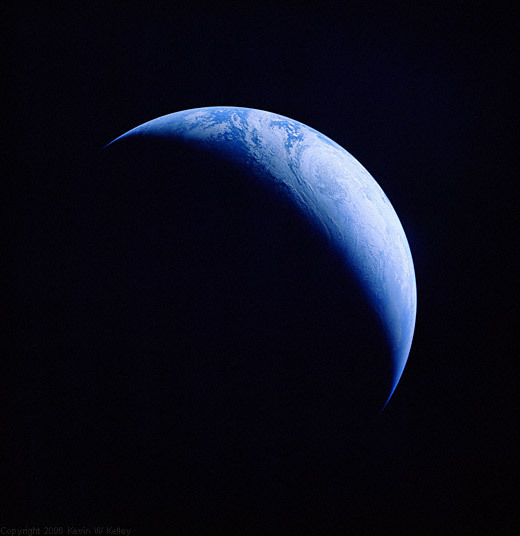 A 70 mm camera was programmed to look out a window toward the Earth and take a series of such photographs from "high apogee." This is the result! 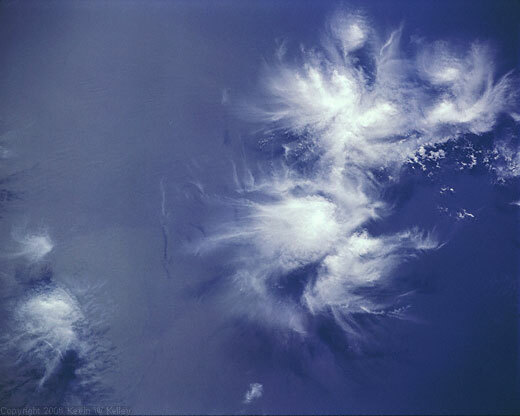 The cloud formations are caused by the Inter-tropical Convergence Zone. 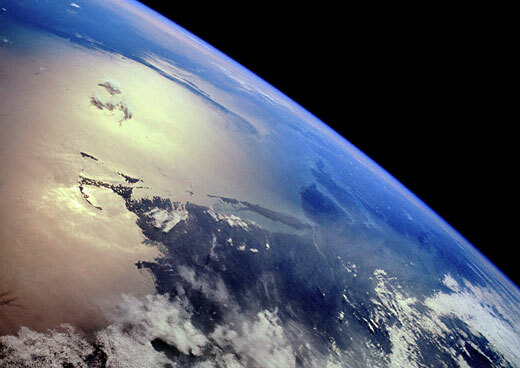 The golden color is due to African Sahara dust in the atmosphere blowing across the Atlantic. 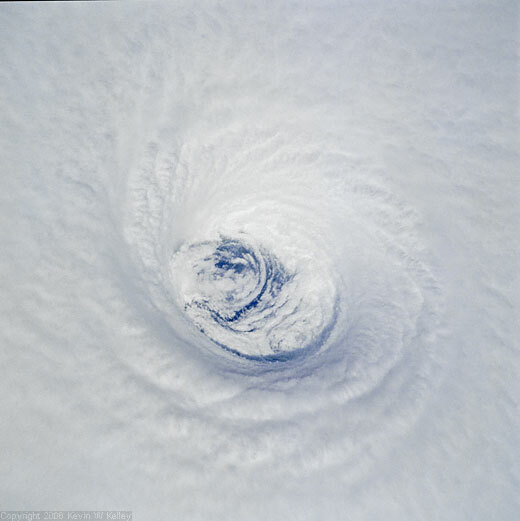 Tropical thunderstoms form over the ocean in this oblique view of the horizon. Photo taken by Cosmonauts V. Kovalyonok and Ivanchenkov on board the orbital space complex Salyut 6 - Soyuz 29 - Soyuz 31, September 1978. Fotokhronika TASS. Spectacular oblique view down east coast of United States from Maine to the Chesapeake Bay and further south. 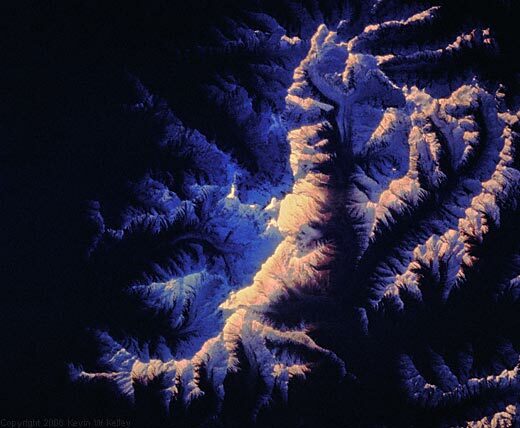 Cape Cod is accentuated and highlighted in sunlight center of image. 1994. 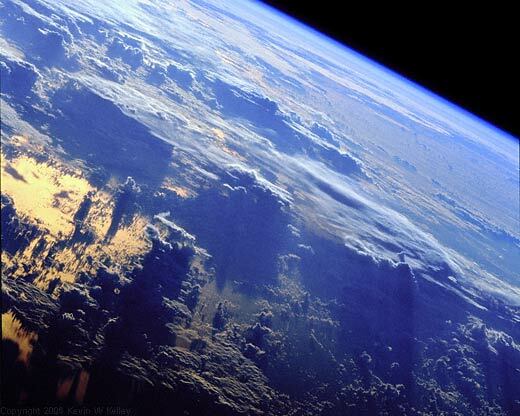 Taken from 164 nautical miles up. 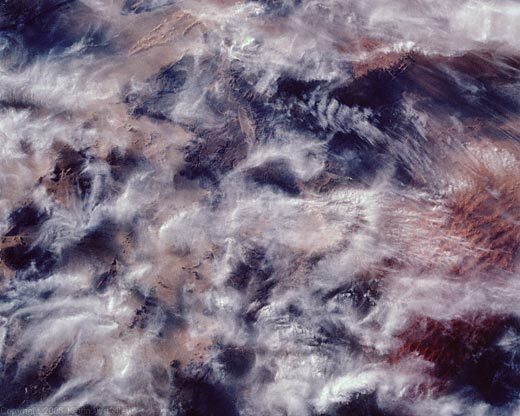 Cirrus clouds lazily drift in late afternoon light above the dunes and rocky mesas of the Sahara desert pf Southeastern Algeria, about 1,000 miles south-southeast of Algiers, between Bordj-onar-Driss and the city of Tamanrasset. Near the upper left of the photograph is an area of star-shaped dunes. This classic shape is caused by winds blowing in all directions and forcing the sand upward. 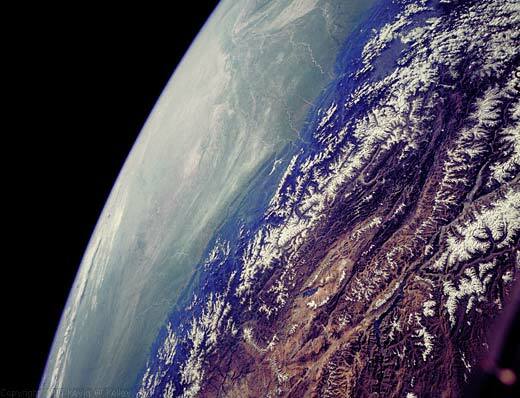 A southwestern view of the Greater Himalayas bordering the Karakoram Range. India is to the left, Pakistan to the right, and China is in the foreground. The valley of the Indus River is in the right background and the fabled Vale of Kashmir is near the right edge of the photograph. Near the lower edge are the great peaks of the Karakoram Range. Cirrus clouds flower over the Gulf of Mexico near the mouth of the Mississippi River. Sunset on Mount Everest and nearby Himalayan peaks turn their snow cover into warm yellow as dark evening shadows settle in to cool the mountain valleys. 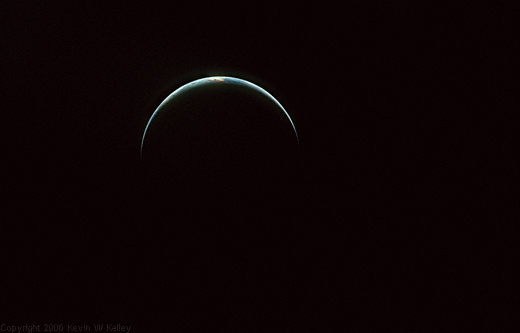 A very slim crescent Earth seen on the return trip from the moon. Clouds often take on a golden cast near the terminator at sunrise or sunset which cause a bright golden spot to be visible at the center of the crescent.